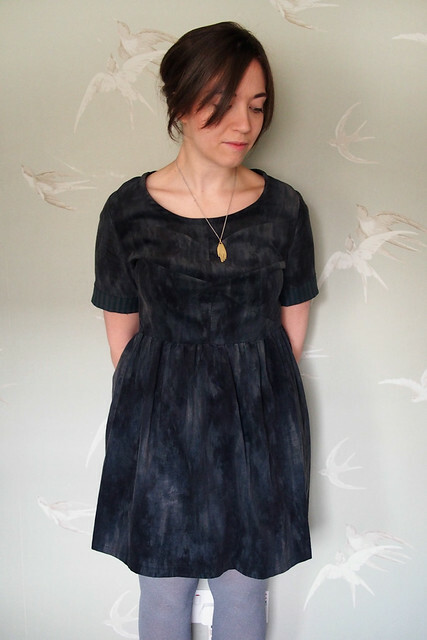 Classic sewist situation: a family wedding at the weekend with people who know I sew and will definitely ask if I’m wearing a me-made… so naturally a new frock was called for, since I don’t have a stock of fancy frosting dresses to pull out for special occasions. I didn’t have much time to make something, so stuck with an easy but statement fabric and guaranteed fit by using my block with minimal adjustments. As it turned out I nearly didn’t make it to the wedding at all due to a suspected case of norovirus (which was luckily a false alarm) though I was feeling decidedly peaky all day anyway, hence these rather rushed photos and my sallow face. Shame as the wedding was set in beautiful grounds and it was a nice day for mid-December. 1. Rotated the shoulder darts into the waist darts on the front bodice. 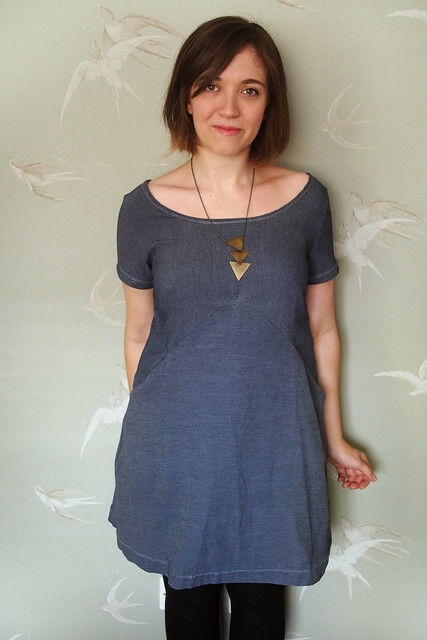 Cut the front and back bodice with about 1″ extra ease at the side seam. 2. Cut the skirt front and back with about 1″ extra ease at the side seam too, tapering out to about 3″ extra at the hem for a gentle A-line. 3. Instead of sewing all the darts as normal I just folded and stitched them down between the notches as soft pleats, all tucked towards the centre. Easy! Since the dart placement already matched on my skirt and bodice block, the pleats match up nicely too. The fabric is lovely stuff that I bought as a 1.75m remnant at El Palacio de las Telas in Mexico; I’m not sure if it has a bit of silk in or it’s all synthetic. It was drapey enough for the soft pleats yet sturdy enough to be fairly easy to work with, and didn’t require lining which saved a bit more time. I didn’t have loads of spare fabric to play with but tried to do a cool print placement on the front at least, with the dark area concentrated in the centre. 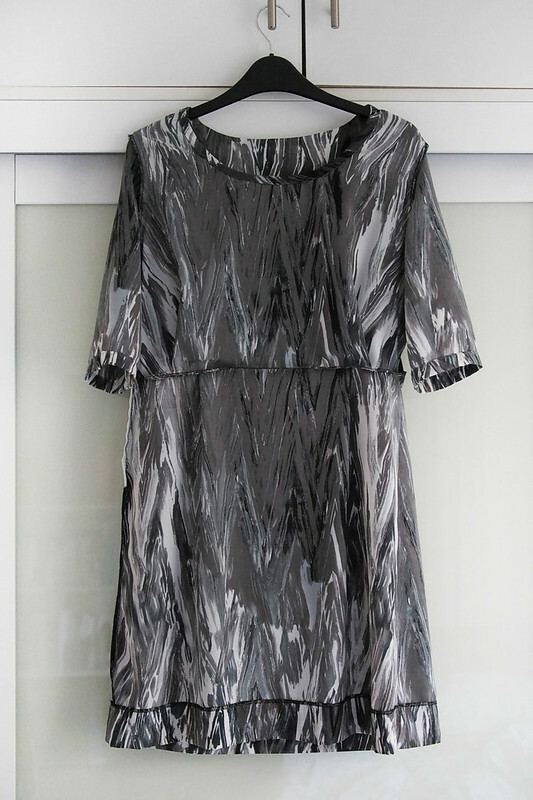 It’s got a mix of serged and French seams, a side invisible zip, and blind hems on the hem and sleeves. The bias-faced neckline is slipstitched down by hand. 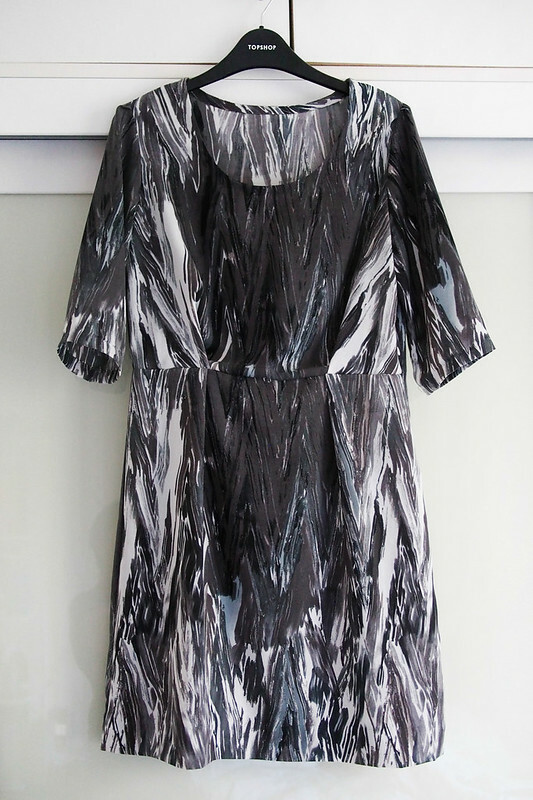 This dress was supremely comfortable to wear, due to the good fit and little extra ease I added. 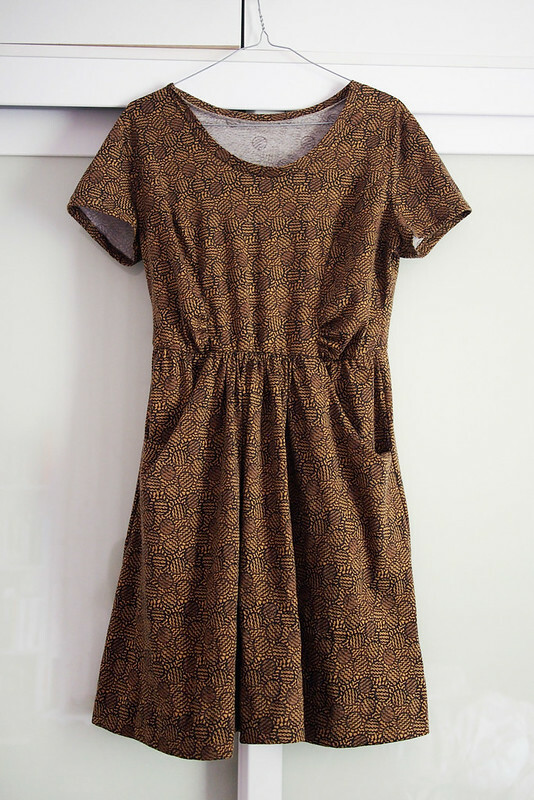 Definitely a frock I can roll out again for other occasions, and I may use the same pattern again in a more casual fabric for a day dress. This was a funny little experiment in pattern hacking/self-drafting. I’m not sure how I feel about the result – it’s a bit odd! 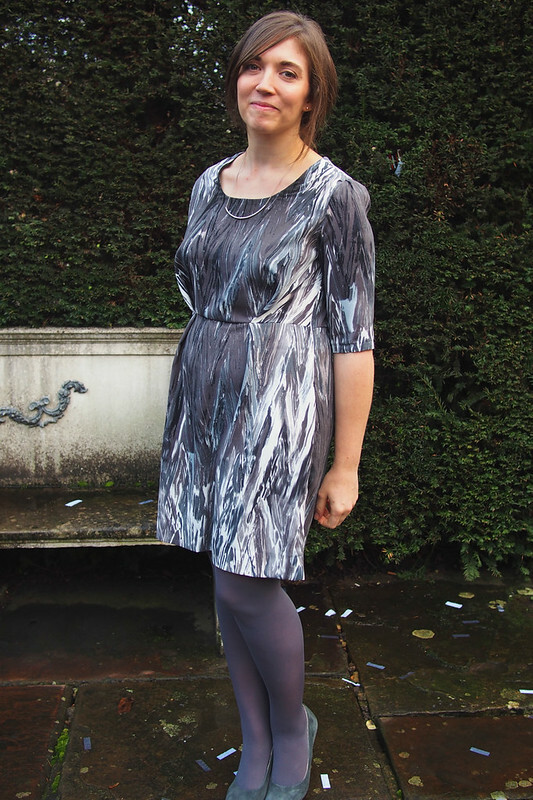 Basically it’s a cold-weather-appropriate spin on the Deer & Doe Centaurée dress. I knew I wanted to try this hack as that bodice is simply too nice to only wear in summer (previous versions here & here). Fact fans: Centaurée is the much less pretty-sounding ‘knapweed’ in English – all D&D’s patterns are named after plants and flowers. I think this dress is definitely more knapweed, ha ha. 1. Rotate darts to the lower armsyce and centre front, using the Centauree pieces as a guide. 2. Snip through the rotation apex. 3. Round off the sharp corners. 4. Cut the bottom into a separate piece, using the Centaurée pieces as a guide. At the last minute I also cut the top piece diagonally to reflect the original neckline – 8 piece bodice, yo. Then just re-add seam allowances and sew per the Centaurée. The back and sleeves are straight off my block. So I’m not sure what is making the dress feel a bit weird. 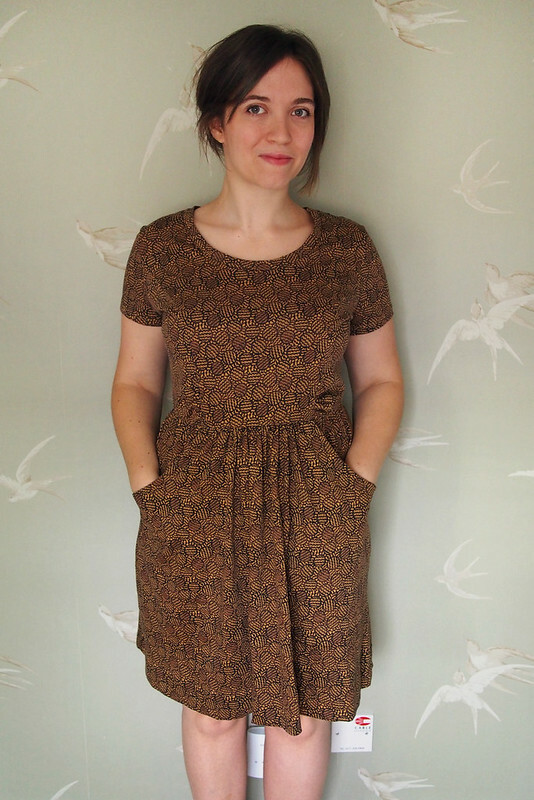 I think it’s partly the fabric, which is a double-faced lightweight corduroy I bought from Miss Matatabi. It’s lovely fabric – I originally bought it for pants but changed my mind – but something about it with this dress is giving me a gothy/grungy vibe which isn’t very me. 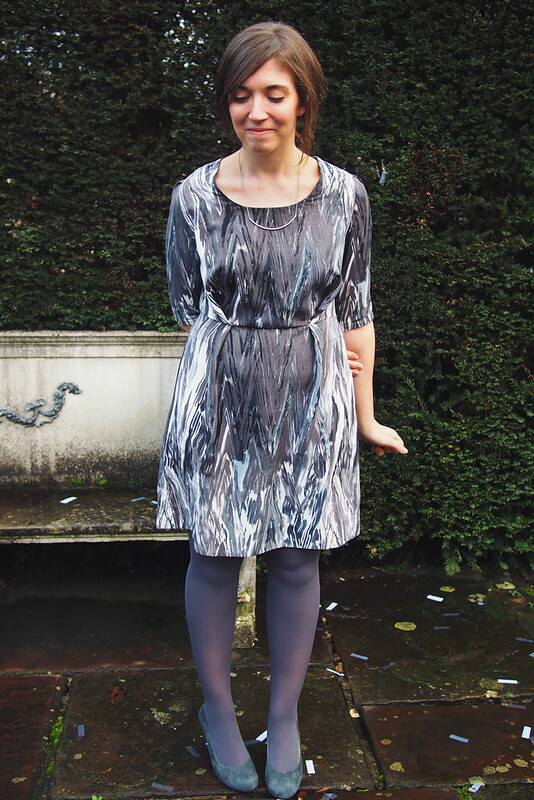 It was great to sew with though and I love that the dress looks lined thanks to the stripy backing, which I’ve also turned back on the cuffs. It also fits well, it’s nicely made and comfortable, so it’s not those things. Perhaps it’s the design itself and the Centaurée really doesn’t want to be a sleeved dress? Anyway it was fun to kind of reverse-engineer the pattern and figure out how to draft something like this, so I’m pleased I made it, and I have worn it despite my reservations. I may well have a go at a v2 sometime – I’m thinking a cheerier floral or chambray would be nice. What do you think – odd or cool? Like my Coco-Sandra, this outfit is another one I’ll be wearing all autumn. 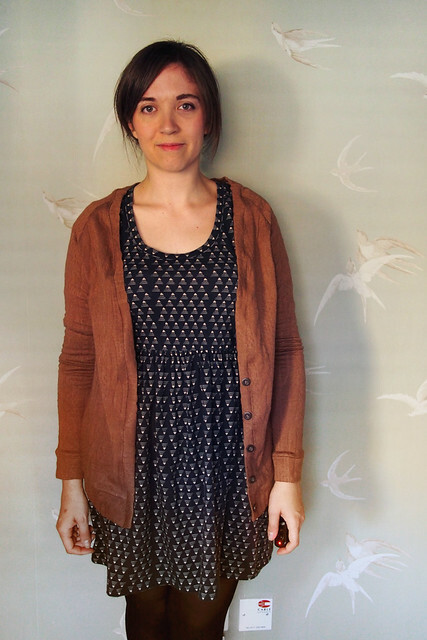 I wasn’t going to blog the dress since it’s pretty darn basic, but I snapped some photos of this outfit in the morning when I wore it because I happened to have made the cardigan too. I love a 100% me-made day! 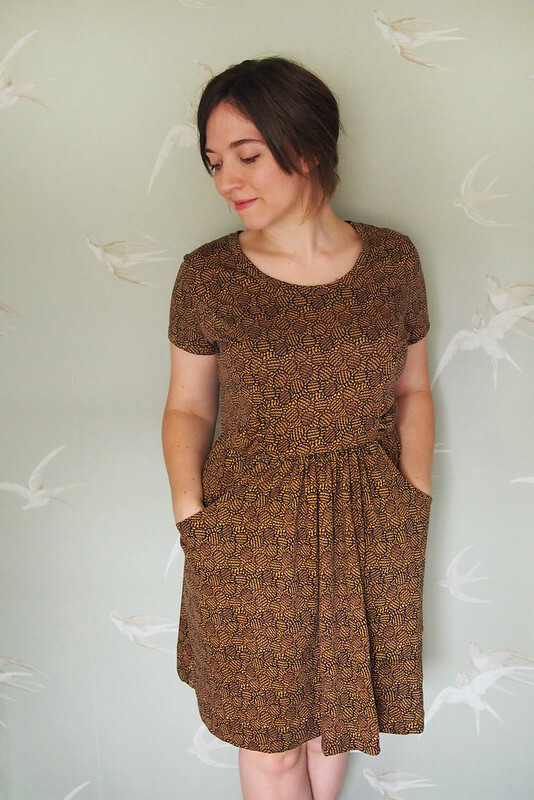 The dress is a Deer & Doe Plantain tee ‘hack’, which you can find Anna’s tutorial for here. It’s made from one of Leah Duncan’s newest collection for Art Gallery, which I got from M is for Make (though it’s nearly sold out – Finch Sewing Studio have it for a good price too). I was interested to see what the quality is like of the Art Gallery knits, and overall I’m pretty happy with it. I’d call it a light-medium weight, but it’s stable and easy to stitch. It’s got plenty of 4-way stretch and good recovery. Ideal for a tee or babydoll dress really, and I reckon it’d make some pretty comfy leggings too. I’ve washed it a few times already and it seems to be holding up well. 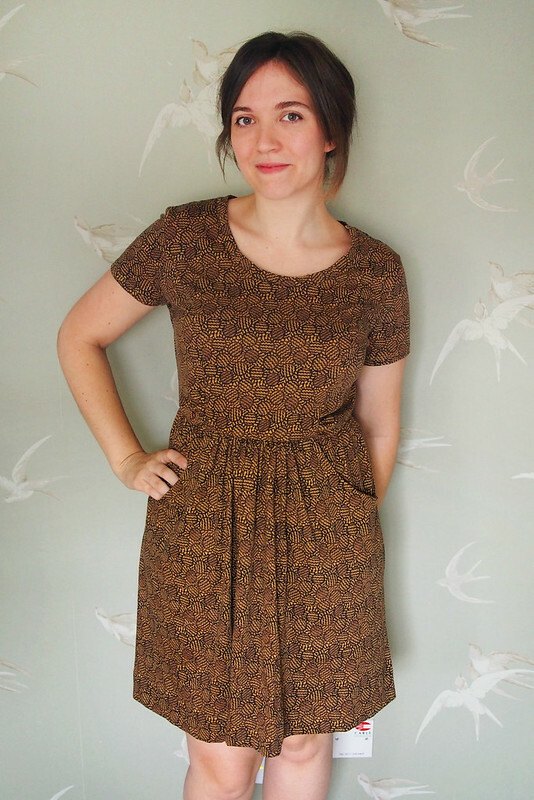 This was a no-brainer sew – all overlocked and the hem straight stitched since it doesn’t need to stretch. I should really have tried harder with lining up the print because the waistline is a bit skewiff and the mountains are upside down on the skirt and sleeves, ooops. It’s kind of a secret pyjama dress – sooo comfortable – which is why it’s shot to the top of my most-worn list despite the wobbly bits. Must make more! 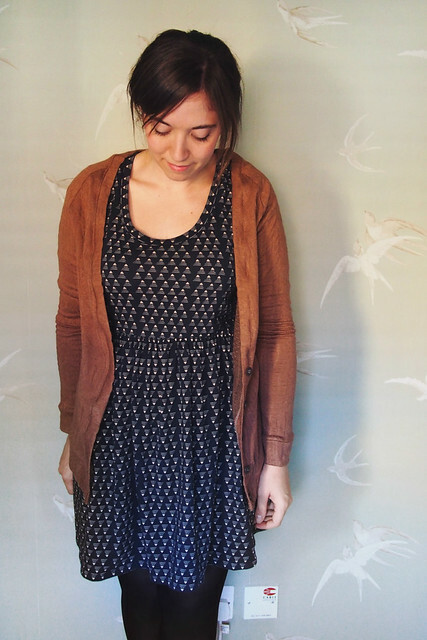 I made the cardigan pattern myself by tracing off a very beloved Madewell knit that I bought last winter. 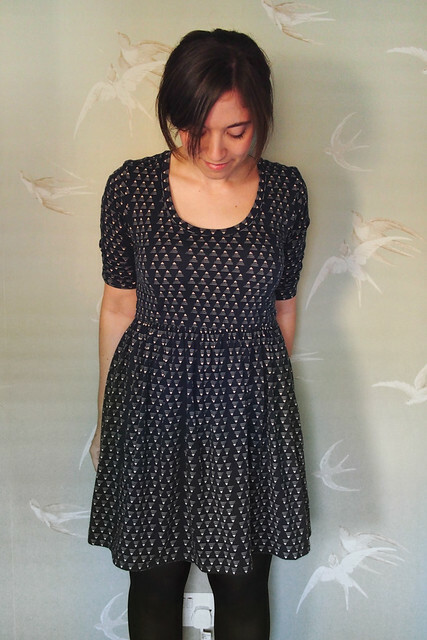 It was really simple to trace and sew – I made the entire thing from pattern to finishing in an evening. 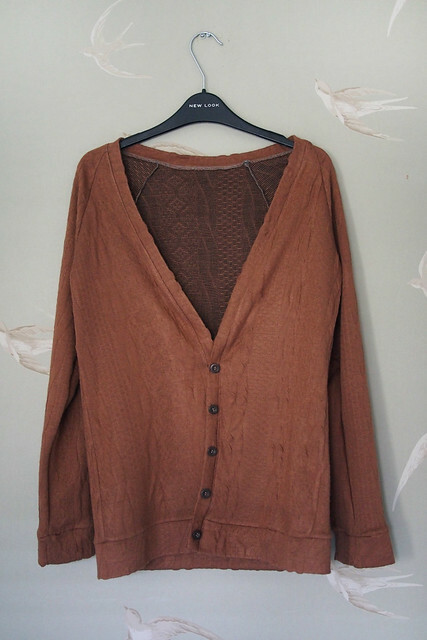 The fabric is a cable textured double-layered knit from Minerva. It’s only £3.99/m and is really snuggly since there are actually two layers of knit bonded together. 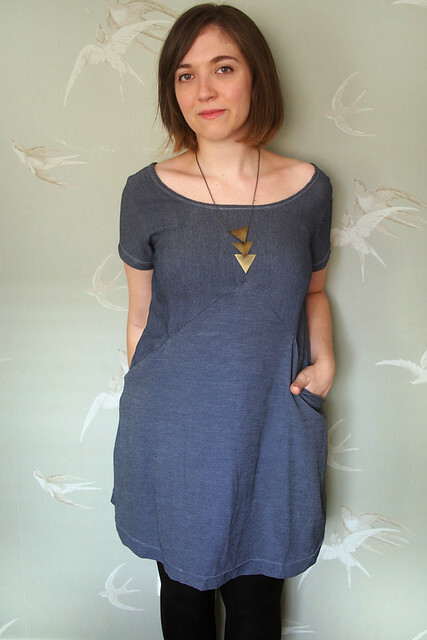 It’s got a raglan sleeve construction with the hem and neck bands sewn on afterwards. I topstitched down the overlocking around the neckband to encourage it to stay flipped outwards. I put buttons on for that genuine knitted cardigan effect but didn’t bother with buttonholes since I’ll never wear it closed, ha. Unfortunately it turned out just a little bit too small all over, mostly because I didn’t allow for the fabric I chose having much less stretch than the original cardigan. Next time I’ll just add an inch or so all over and perhaps choose a looser fabric. 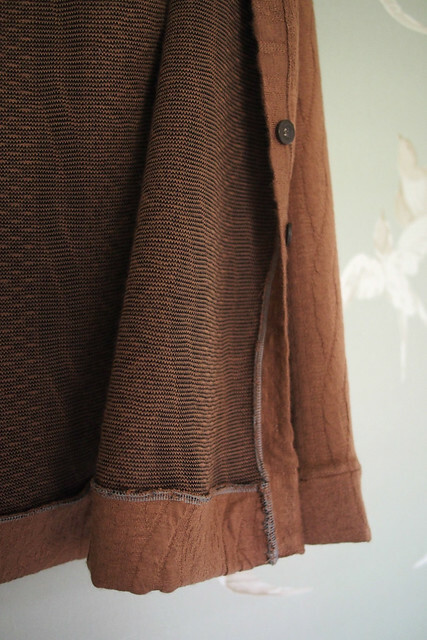 It’s finally actually starting to feel cold here in London so I think Project Coat will be my next big project. Here’s another little self-draft experiment that didn’t quite work out 100% perfect but I thought it’d be good to share anyway. I’ve been pinning approximations of my dream denim dress for quite a while now and decided to use it as another chance to try out designing with my blocks. · Skirt: Rotated waist dart out to create fullness. Used the same piece for front and back. 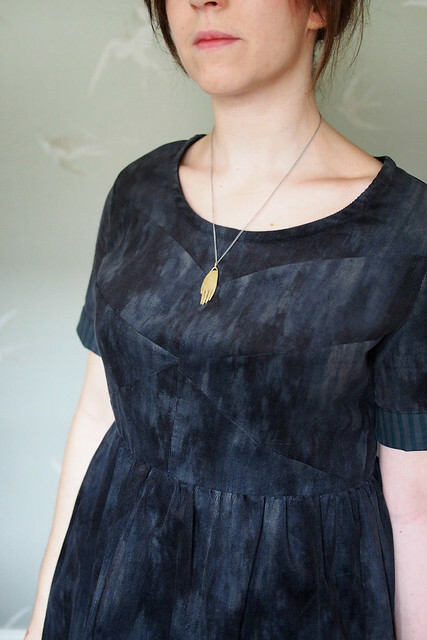 · Drafted a pocket piece to sit inside the sloping edges of the bodice and skirt. I’m beginning to find that drafting the pattern is one half of the self-design challenge, and the other equally significant half is actually sewing up your creation in a sensible order with no instructions to fall back on! I struggled a bit trying to figure out the best way to attach the pockets and to get a nice point on the triangular panel’s top corner. The neckline is also not as planned. I bound it with a bias strip first off, but didn’t like it and cut it off, and instead turned and hemmed it with a twin needle. 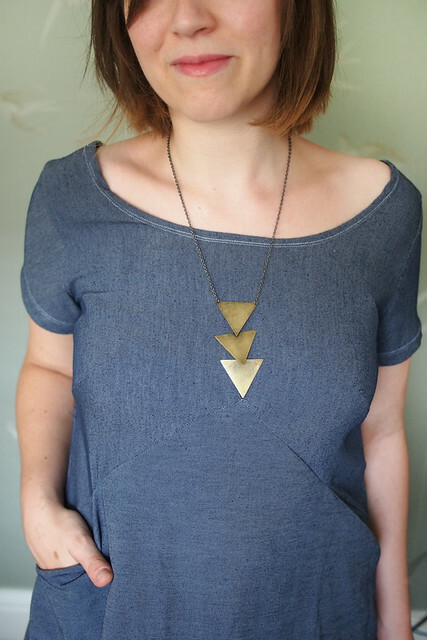 Unfortunately cutting off the original neckline made it all far too wide – it barely stays on my shoulders now. This is especially apparent from the back, where I had this idea to make the a deep V to mirror the seamline. I interfaced the diagonal edges with strips before hemming but it still wasn’t enough to keep it in place. Next time I’ll tighten it all up and consider another finishing technique. 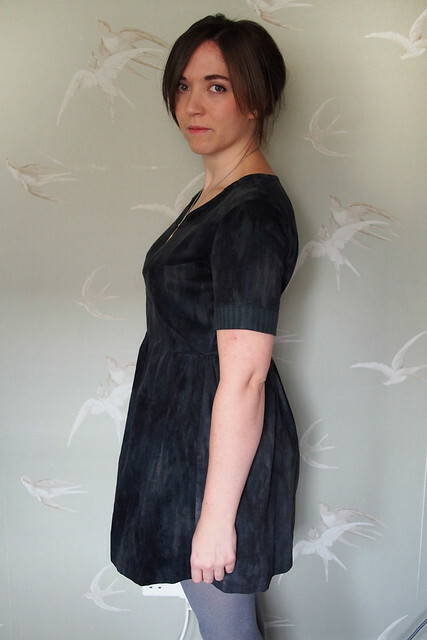 The fabric is an extremely soft and supple denim which I bought from our jolly up to Minerva Crafts – here it is on the website. This stuff would be great when you want a denim-y look but with added softness and comfort – and unlike most chambrays it has a superb drape and doesn’t stick to tights. Actually for this dress a slightly stiffer fabric would probably have been more suitable and easier to work with given all the funny angles and clipping required. But it’s a dream so wear – sooo comfortable. I’m really enjoying my forays into self-drafting. It’s a ton more work, but I like that it’s forcing me to slow down and really consider what I want from a garment. I don’t actually need that many clothes at the moment, so am happy to spend longer on each garment, building its design from the ground up rather than dive into speedy sewing. Plus since it’s from your blocks at least your garment will always fit! It’s not for everyone, but I hope you find my adventures in self-drafting interesting to read about. This dress is such a cake make. Me to a tee and seamlessly fitting into my everyday wardrobe. And it’s (half) drafted from my block too so the design is unique. Yay to that! I wanted to see if a) my block would work with a knit; b) if I could hack some basic design details into it. I figured the fit would work in a knit as is because there’s minimal ease in the block – too little for a comfy woven dress but fine for a stretch. In fact I think I need to size down my block for knit makes in the future as it turned out a wee bit too big all over. But it basically worked well and I had a lot of fun drafting it. Here’s an overview of the changes I made to my block to get here. 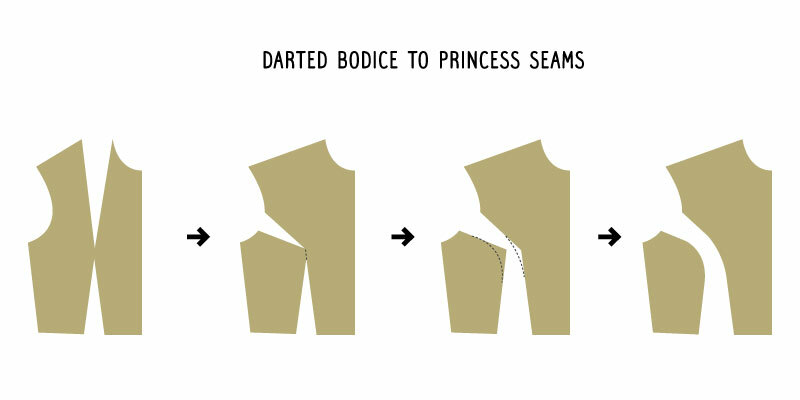 Converting the double-darted bodice into princess seams was an easy as rotating the top dart to mid-armsyce, slicing into two pieces through the bust apex and smoothing off the curve. I’m so pleased princess seams are this easy to create as they are my favourite bodice shaping – no blasted dart marking, quick to sew, and easy to fine-tune fit on my frame. 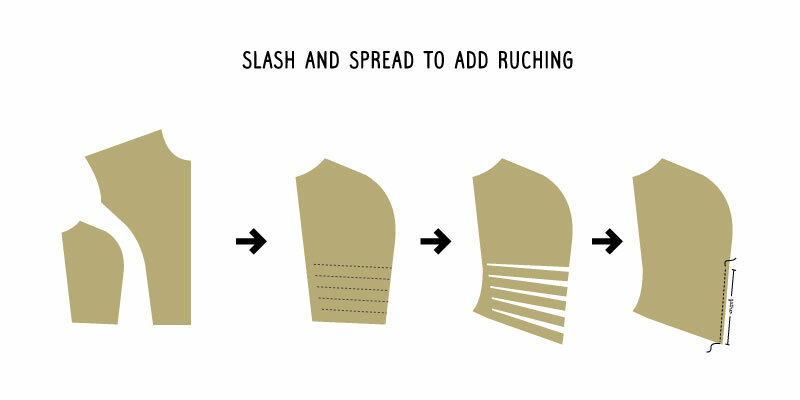 Then I added a ruched detail by slashing horizontally into the side pieces and fanning them out downwards. 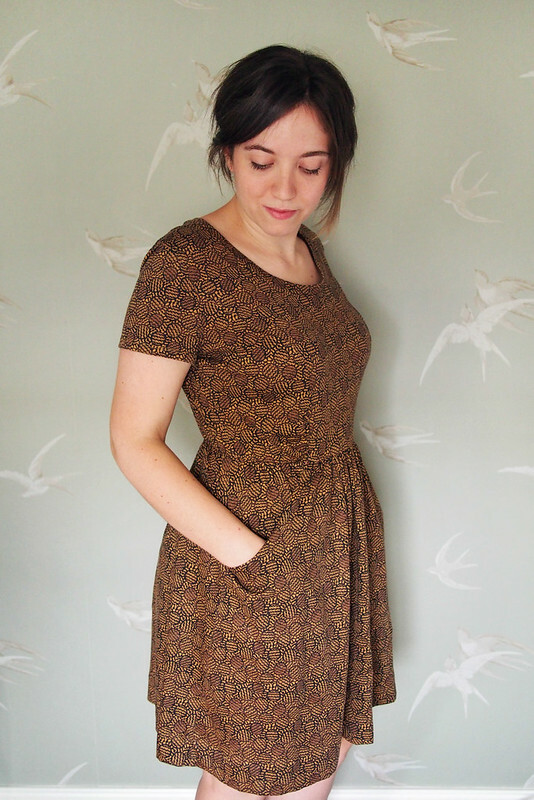 This wee detail was inspired by vintage Butterick 2315, another ‘cake’ dress that I wear all the time. I added some clear elastic to the gathering to encourage it to keep its shape. 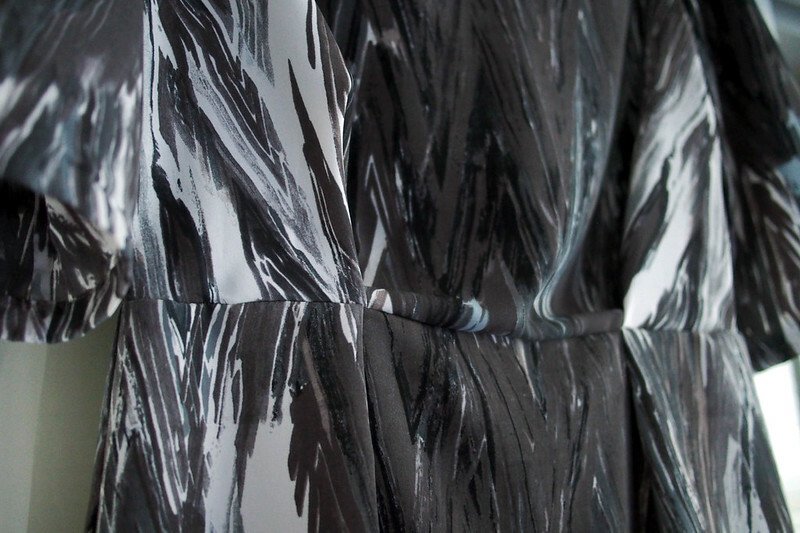 The print kind of buries the detail unfortunately – need to try it on a solid sometime. I added the set-in sleeves from my block which fit perfectly in a stretch – I need a bit more wiggle-space to use them with a woven. I haven’t sewn a set-in sleeve in forever, ha, so did it the lazy way: set in flat, with the cuff and side seam sewn in one. The skirt admittedly is not from my block at all – it’s that old TNT Simplicity 1610 again, gathered at the centre front and back to fit the bodice. 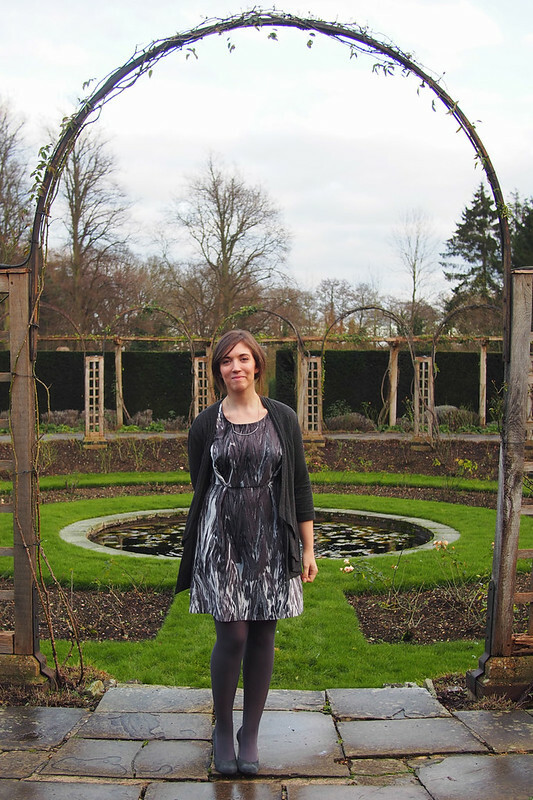 Why use any other skirt to be honest – it’s versatile (you could pleat or gather it onto nearly any bodice), I find it very flattering, and the deep scoop-y pockets are perfect for my phone or fidgety paws. 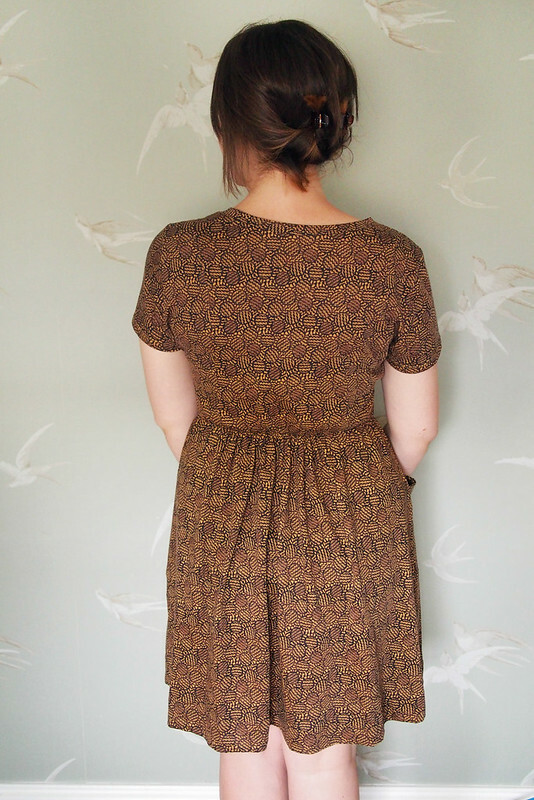 This fabric is Liberty ‘Achilles’ cotton jersey bought on my trip to Shaukat back in May. 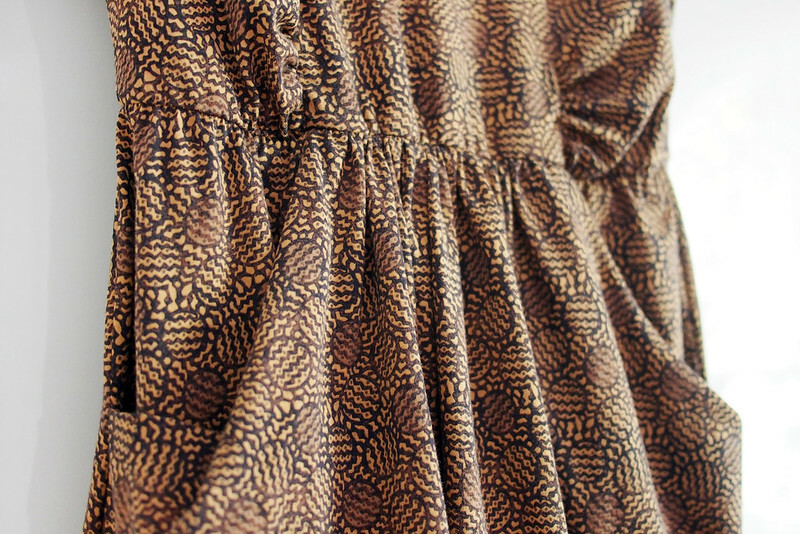 Obviously I’m obsessed with the sludgy goldy-browny colour, and the print is like a mini African wax design. 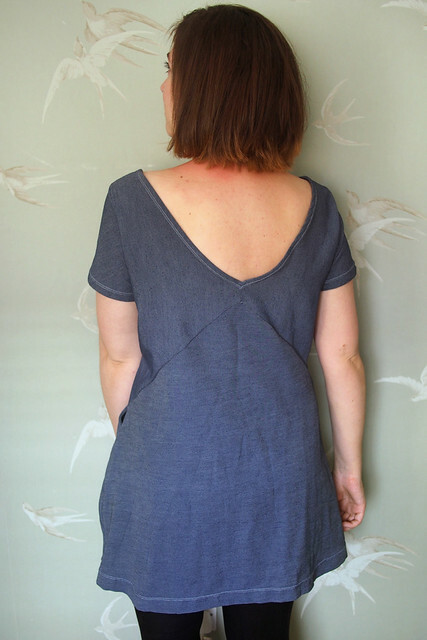 I do find that Liberty jersey likes to curl a bit as you work with it and I don’t think the stretch recovery is all that great, but it does feel lovely to wear and it’s heavy enough to give a nice swishy drape. 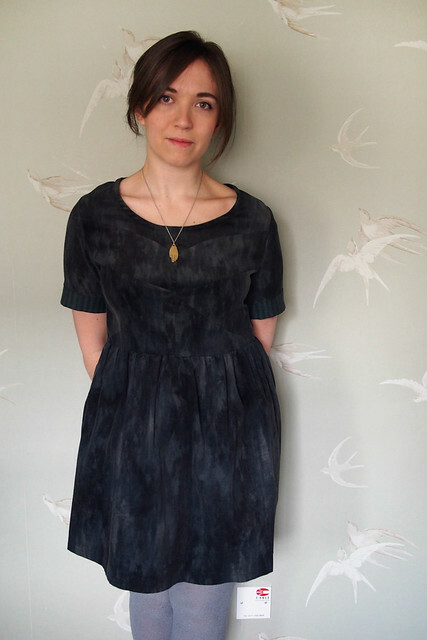 My friend said of a photo of this dress on the hanger ‘This looks like you – even though you’re not wearing it’, which I think sums up the best kind of cake sewing for me. Speaking to other sewists, I know how difficult it can be to make things that truly work for you, rather than being distracted by the endless parade of new patterns and fabrics out there. But for me it’s really important to aim for that, and I think designing from my dress block will make it all the easier. 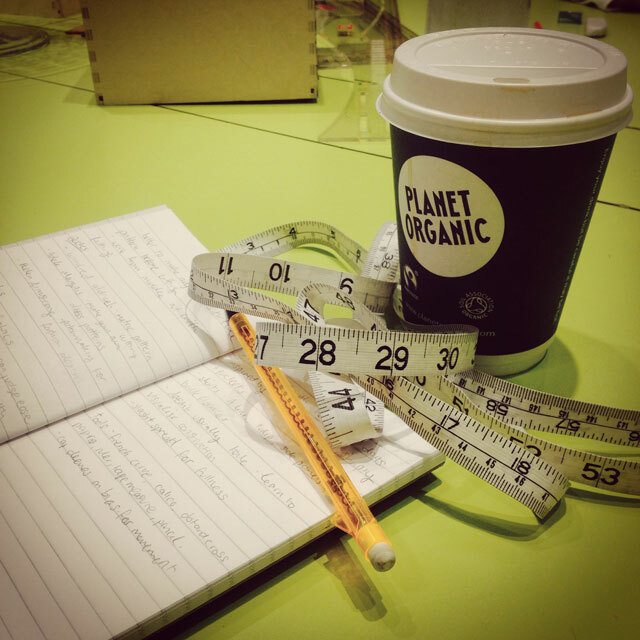 In a delightful case of right place right time (and a great case of karma from a returned favour), last week Rachel from Ray Stitch invited me to a last-minute place on their Pattern Cutting Summer School course. Three days of learning how to build a bodice, skirt and trouser block exactly to my size, and learn how to adapt it to make any pattern I could dream of? SIGN ME UP! I quickly shuffled some work around and found myself at Ray Stitch bright and early last Monday morning with three more students and our fabulous teacher, Alice Prier. I’ll give a brief overview of what we covered, but there were so many other hints and tips Alice spoke about that you’d really want to take a class yourself to pick everything up. Day one started with an introduction from Alice to her work and techniques. She’s a self-taught lifelong seamstress who now runs a made to measure business, Alice & Co. She also has a fashion travel blog and is soon to launch some beautiful printed patterns which I got a sneak peek of. From the beginning I was rapt by her vast knowledge, soaking it all in sponge-like and scribbling page after page in my notebook. Each day we tackled a different block, with the morning spent drafting and fitting and the afternoon learning about ways to adapt and add design. We used three different methods: plotting measurements onto a ‘grid’, adapting a standard size block, and fitting a calico toile on the body. We did the skirt on day one, probably the most straightforward. After pairing up to take hip and waist measurements, we drew the rough sizing onto a folded piece of calico, with the fold forming the centre front of the skirt and then the back next to it. (Alice explained it’s good to draft like this so you can check the side seams are nicely lined up.) 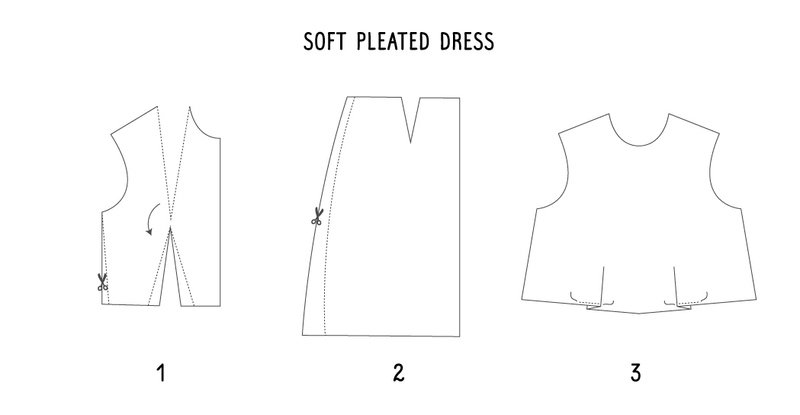 Shaping from waist to hip is made via darts and shaping in the top of the side seam. Edges are smoothed off with a French curve then the calico is sewn up for a first fitting. All of our tweaks were pretty minor: lengthening and adding to the darts generally to create a sleek, well-fitting shape. The calico is then cut out flat along the adjusted lines and traced onto dot-and-cross paper. Ta-da, one basic skirt block from which a million variations can spring. In the afternoon, we played around with half-size paper blocks to learn how to manipulate the darts and add in other design elements like pleats, yokes, godets, and flare. This part was so fun – not just because it included scissors, sticky tape and cake making it feel like preschool – because you could really start to visualise how these basic blocks can be transformed in any kind of design you like, while being sure it will always fit perfectly. 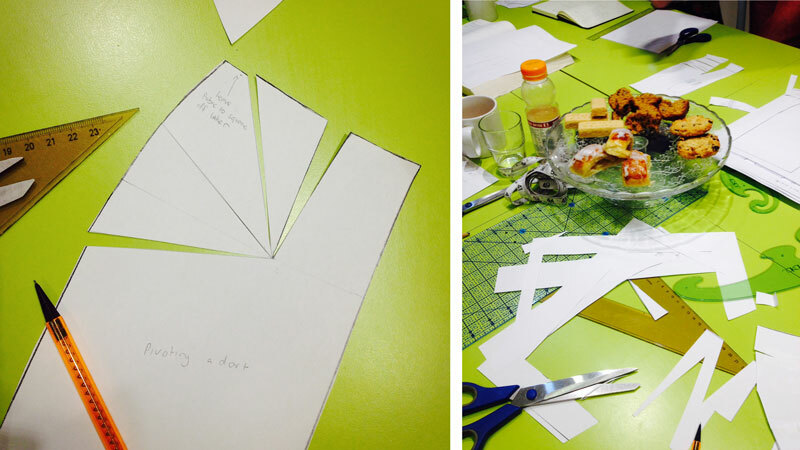 On day two we drafted the bodice by starting with Alice’s standard size blocks. 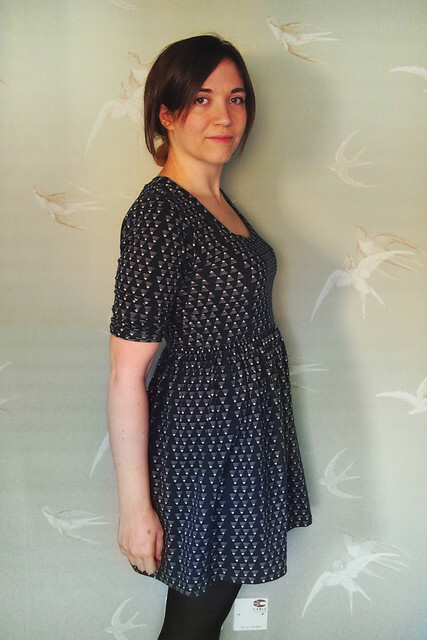 On Alice’s recommendation (after so many years she can read a body size extremely well) I cut a size ten with an FBA – I’ve never done an FBA on a pattern before but apparently I needed one as it solved the issue I always have with bagginess in the upper chest. I had to make a fair few other adjustments, as I knew I’d always needed after making the same adjustments over and over to commercial patterns. As well as the FBA we moved the shoulder forward, took a back neck dart (which got rotated into the waist dart), did a large swayback adjustment and added more ease into the sleeve head. Again, we spent the afternoon leaning about how to adapt that bodice and turn our block into princess seams, swingy shapes, blouses, jackets and so on. We also compared the bodice to our skirt from yesterday to see how they could be combined to make dresses. The biggest WOW moment for me is that just because the darts aren’t sewn it doesn’t mean they aren’t there, because just like the skirt they can be pivoted downwards and left open to create fullness while still leaving shaping intact. That explains why tops like the Grainline Scout work so well with no visible darts – they are there, just not sewn up! Day three we tackled trousers. I’ve sewn several pairs of pants now that fit pretty well, but actually starting from scratch and learning the theory behind the fitting means the block should be even better. We drafted these using the classic from-scratch technique, inputting our measurements onto a grid of dot and cross paper. Those are then calico’ed, fitted on the body, and the adjustments transferred back to the paper. I eliminated the front darts, lowered the waist (more at the front than back), slimmed the legs and sucked out some excess under the bum. Afterwards we chatted about converting the back darts to a yoke, pockets, waistbands, pleats, adding and removing ease, and so on. I can’t wait to give these a go in real fabric and see how they compare. After I got home I did a bit more fine-tuning, and tried attaching the skirt, bodice and sleeve to see how they all worked together. Hopefully you can tell even from the crappy fabric and exposed seams that the fit is pretty great: none of the usual sway-back pooling, gaping shoulders, hip tightness etc, and nice straight perpendicular waist and side seams. The block provides a basic ‘shell’ of your body with minimal ease, so when you alter the block you can calculate how much ease to add (or remove) from this baseline. You do need to alter the bodice pattern a bit depending on if your garment will be sleeved or sleeveless so I think I’ll do another block for when I decide to use sleeves (you can see a bit of pulling around the armsyce so more ease is needed). You can also easily adjust the blocks to use with knit fabrics – one simple tip is to use the back bodice as the front too, with adjustments to the neckline and armsyce. I’m really keen to make my knit blocks as well. 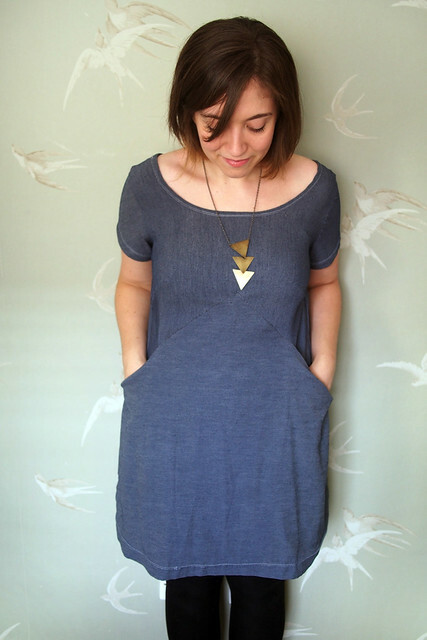 I can’t recommend Alice’s pattern cutting class highly enough. She was a fantastic teacher, so inspiring and encouraging and happy to share her years of knowledge. Check out upcoming dates here – she also teaches ‘Recreate a favourite garment’ which I’d love to do as well. If you’ve been thinking of making your own blocks, either in a class or using a tutorial at home, I’d say definitely take the time and DO IT! It will completely change your sewing because you’ll learn even more about your body and how patterns are constructed to turn the 2d fabric into a 3d curve-fitting shape. 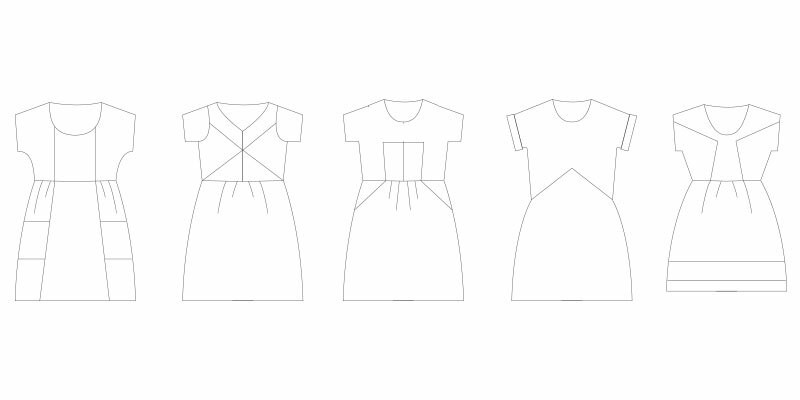 Even if you’re not interested in designing your own patterns, you can compare the block to commercial patterns to check/adjust the fit before getting started (we covered this in the class as well). So have I sold you?! I’m off to make one more toile of my blocks to check they’re 100% correct, then expect some self-drafts popping up here in the near future. Ray Stitch offered me a discounted last-minute place on the class; views my own.